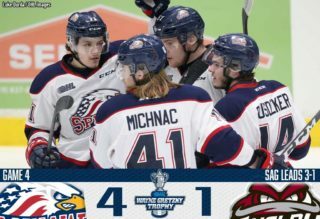 The Guelph Storm pulled to within three points of third place Saginaw in the Western Conference, barraging the Spirit in an 8-2 win on home ice as Nick Suzuki (24, 25) earned first star honours with two goals and an assist. Saginaw’s Ryan McLeod (16) opened the scoring 3:06 into action before the Storm responded with seven consecutive goals, taking out a 7-1 lead just beyond the midway point of the game. Domenico Commisso (4, 5) joined Suzuki with two goals while Cedric Ralph (13), Liam Hawel (25), Nate Schnarr (25) and Zachary Roberts (7) also got in on the offence for Guelph. The Storm did their damage on 35 shots, going 2-for-3 on the power play as Sean Durzi and Isaac Ratcliffe both collected three assists. Cole Perfetti (20) joined McLeod in the goal scoring department for Saginaw as the Spirit fell to 30-14-2-2. Guelph wins its seventh in the past 10 games to improve to 26-13-5-4. The Storm have won two of three against the Spirit this season. Rookie defenceman Gerard Keane (3) scored what stood as the game winner as the London Knights took a 4-3 win in Flint. 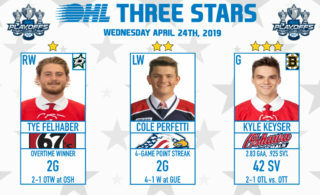 Columbus Blue Jackets prospect and reigning OHL ‘On the Run’ Player of the Week Liam Foudy (26, 27) scored twice, extending his goal-scoring streak to 10 games while 2019 NHL Draft prospect Connor McMichael (30) also found the back of the net. Former Knights draft pick Emmet Pierce (4), Evan Vierling (5) and Cody Morgan (5) responded with Flint goals as the Firebirds were outshot 45-39. London’s Joseph Raaymakers turned aside 36 shots for the win opposite Flint’s Luke Cavallin who turned aside 41 shots his way. London’s fourth straight win sees the Knights improve to a Western Conference-leading 34-7-5-1 record. Flint falls to 9-38-3-0. Riley Damiani (17, 18) and Jonathan Yantsis (35, 36) both scored twice, powering the Kitchener Rangers past the Owen Sound Attack 7-4 on the road. Damiani finished with two goals and two assists while Yantsis had a three-point night, helping the Rangers pull to within three points of the fifth place Attack in the Western Conference. Luke Richardson turned aside 34 shots as the Rangers came out on top despite being outshot 38-29. Newly minted captain Rickard Hugg (19), Mike Petizian (4) and Ryan Stepien (6) also scored for the Blueshirts while Greg Meireles and Joseph Garreffa each logged two assists. 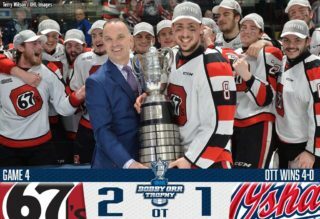 Barret Kirwin (12), Sergey Popov (2), Zach Poirier (9) and Maksim Sushko (11) scored Owen Sound goals as the Attack lost their first game under interim coach Alan Letang. Kitchener improves to 22-22-3-0 while Owen Sound suffers a seventh win in the past 10, falling to 23-21-2-2. With some nasty winter weather in the Grey Bruce region, a total of 492 loyal fans made it out to the Bayshore on Wednesday. The Rangers are 4-1 against the Attack this season. 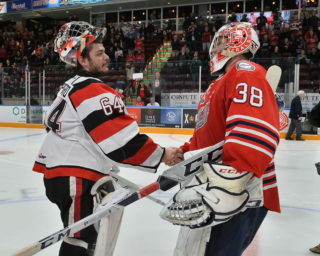 The two teams meet again in Kitchener on Friday. Chris Paquette (20, 21) scored twice while Ryan Merkley (9) had a goal and an assist as the Peterborough Petes doubled up visiting Hamilton 6-3. The Petes put a forgettable northern road trip behind them as Austin Osmanski (3), Michael Little (9) and Liam Kirk (16) also found the back of the net and Hunter Jones turned aside 34 of the 37 shots that came his way. Jan Jenik (3), Kade Landry (6) and Arthur Kaliyev (36) scored for Hamilton as the Bulldogs led 3-2 early in the second period before things slipped away. Hamilton outshot Peterborough 37-25 but the Bulldogs fall to 23-23-3-1. The Petes pulled into a three-way tie with Hamilton and Mississauga for fifth in the Eastern Conference, improving to 24-22-1-1. San Jose Sharks prospect Sasha Chmelevski (16, 17, 18) fired home a hat-trick as the Ottawa 67’s took care of the visiting Kingston Frontenacs 7-1. Rookie forward Marco Rossi (22, 23) scored twice while Austen Keating (17) and Lucas Chiodo (22) also tallied. OHL scoring leader Tye Felhaber picked up a pair of assists as Ottawa outshot Kingston 38-20 and went 2-for-3 on the power play. Ian Derungs (9) provided Kingston’s lone goal while Ottawa’s Michael DiPietro made 19 saves. The 67’s earn their sixth straight win, improving to 36-9-3-1 atop the Eastern Conference. Kingston suffers a sixth straight loss, falling to 12-36-1-0.